The @MaineSkiFamily crew made a long MLK weekend of it at Saddleback. We set up camp in the trail side Mountain Brook condos and had an enjoyable weekend. Weather played a major role in our skiing. On Friday we drove up and got to the base lodge mid-day and the temperature was 21 degrees. The wind was starting to blow from the Northwest and the temperature plummeted to breezy 8 degrees in two hours. Saturday morning we awoke to -14 below zero with a calm wind and it was still below zero an noontime. Sunday temps warmed up to the freezing mark and then we had rain and upper 30's overnight into Monday. Pretty wild swings in the weather! Overall the skiing was quite good. While Saturday was brutally cold and we only got a few runs in, we had a great day on Sunday. Everything was open except the Casablanca glades, and we were able to find soft stashes of snow on most of the natural trails in an around the various hard pack. The groomers were in excellent shape all weekend. There was a good crowd on the slopes Sunday and everyone was having a good time. On Sunday, we skied with a co-worker of mine Jesse and his girlfriend Nichole. It was a lot of fun showing them around our favorite mountain. 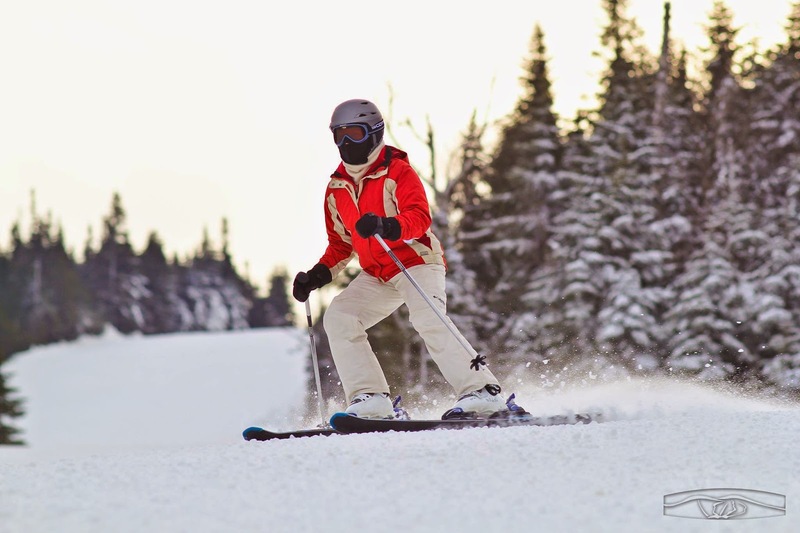 Nichole even got her picture snapped and featured on the mountain social media stream and its website. On an non-skiing note, my wife and I had a fireside dinner by chef Patrick Friel at the Saddleback base lodge while the boys went bowling at Moose Alley down in Rangeley. The food was exquisite and it was a very nice fine dining experience. We highly recommended it! Moose Alley was a lot of fun for the boys and a great off-mountain activity in the Rangeley area. While Saddleback got some rain it looks like they made it through the event OK and have plenty of cover. We are already looking forward to getting back up there. Here is a video of our weekend. Saddleback - MLK Weekend from Alec Salisbury Photo & Video on Vimeo.